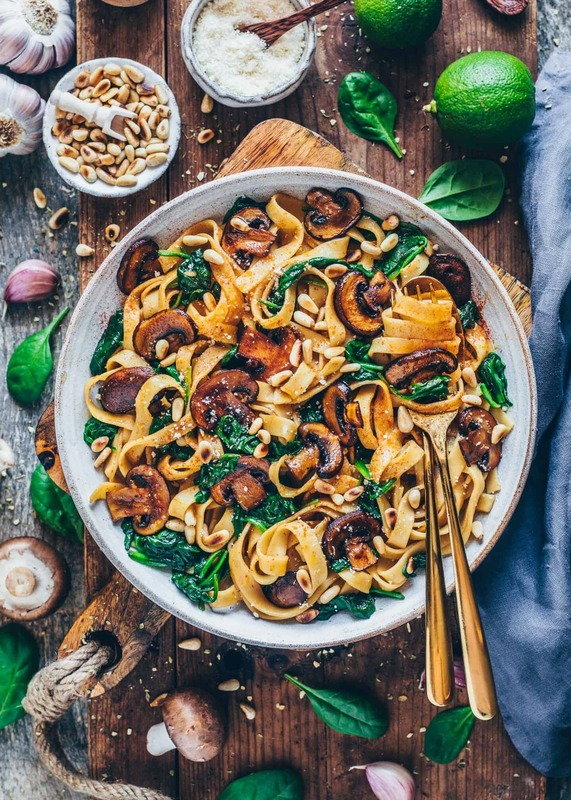 A quick recipe for Vegan Mushroom Pasta with Spinach. 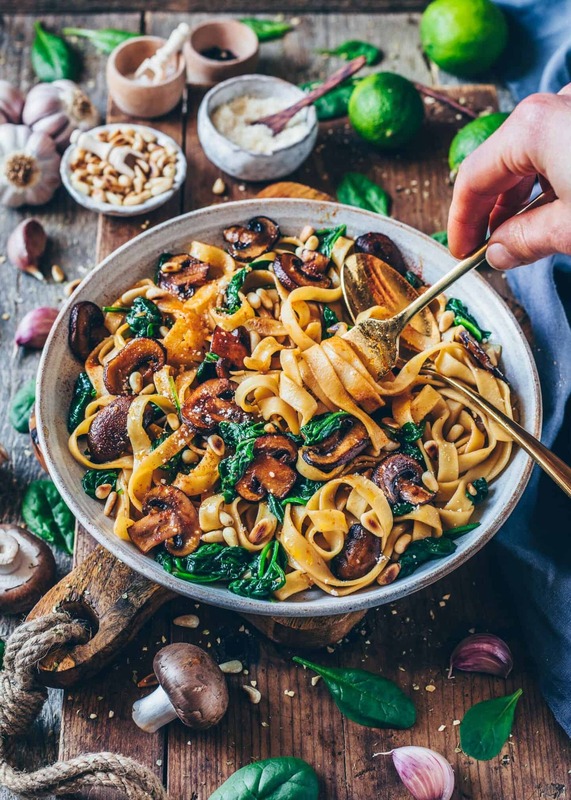 This pasta dish is delicious, healthy and easy to make. It’s ready in only 15 minutes and makes a perfect simple dinner or lunch. When I need a fast and easy meal, there are usually noodles, risotto, polenta or gnocchi with me. 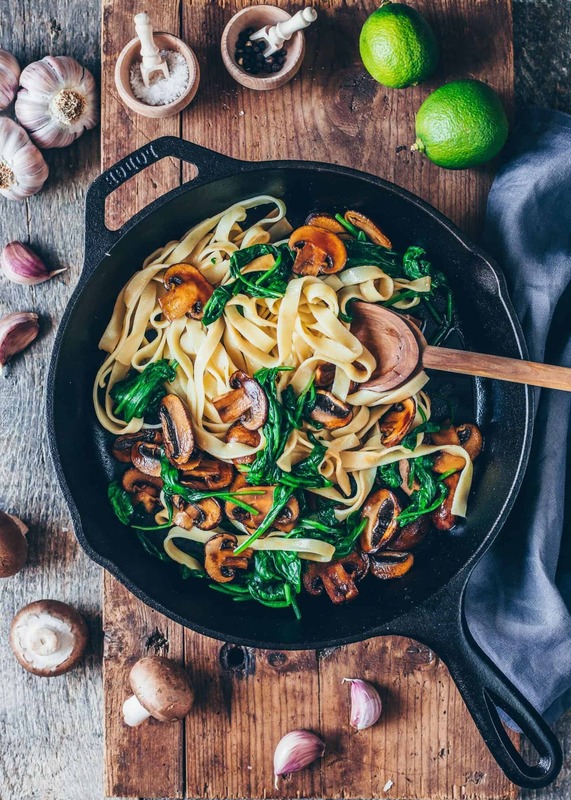 Preferably served with healthy vegetables, such as roasted mushrooms and spinach. 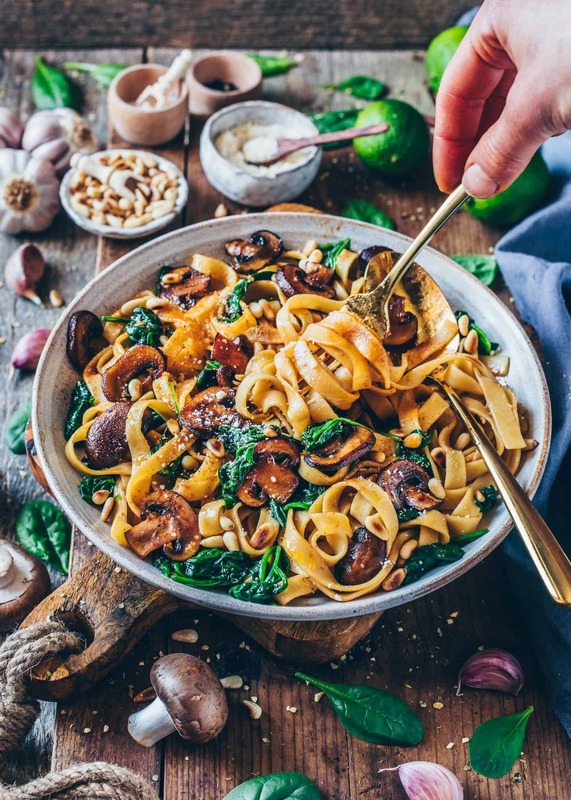 I can‘t count, how many times I’ve shared this dish on Instagram already, because I really cook and enjoy this vegan mushroom pasta so often. And because it’s always very popular with you, I’ve decided to share this easy pasta recipe on my blog. I don‘t have to say much about this recipe. It’s really so easy that anyone can cook it. You can make it with all sorts of pasta you love. 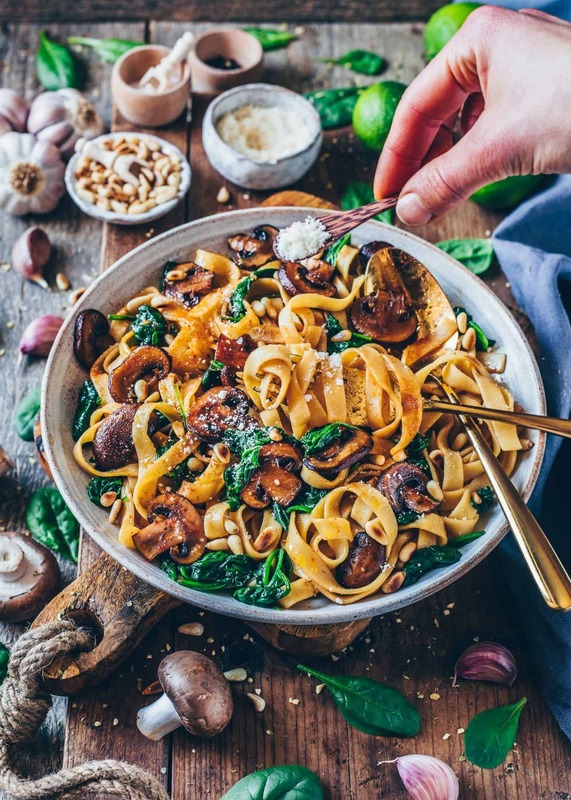 I like tagliatelle, linguine, farfalle, spaghetti, tortellini, penne and rigatoni best – so pretty all types of existing noodles. 😃 However, let’s be honest, the best pasta is Homemade Pasta, right? This recipe not only tastes delicious with regular pasta, but also with ravioli or gnocchi. Whenever I make ravioli or gnocchi, I usually prepare a bigger amount and then freeze it in batches. I think it’s really handy if you always have some homemade food in stock. 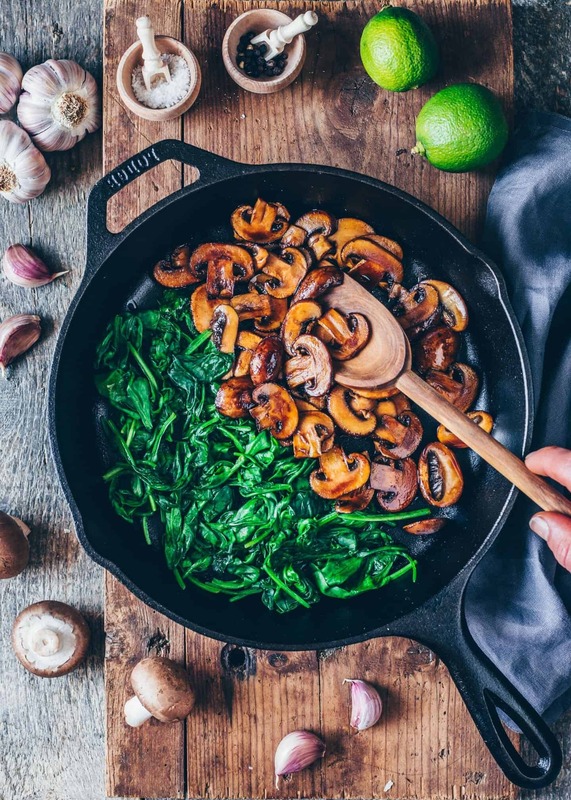 Mushrooms and spinach are healthy and delicious! 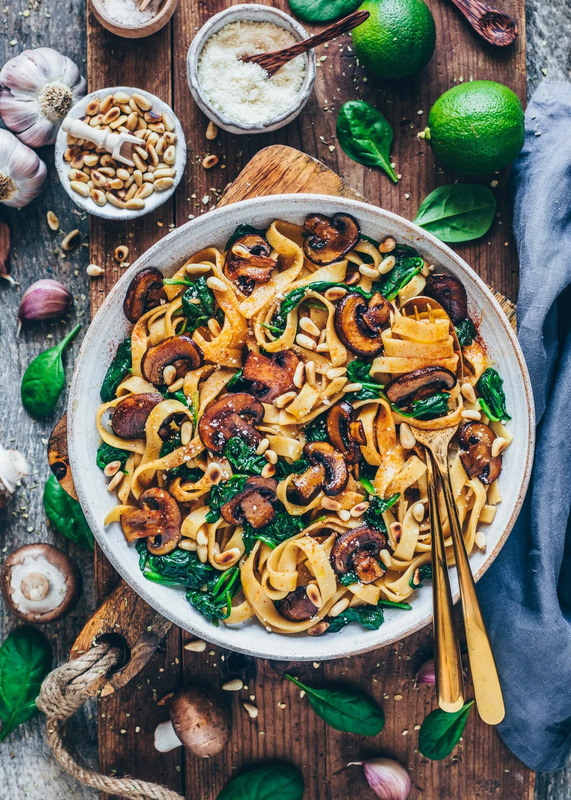 The toppings are also very important for the taste because they add a great flavor to your dish, especially when you use toasted nuts or seeds. That’s why I would never omit them. I like toasted pine nuts best, but I also use cashew nuts, pecans, sesame seeds, sunflower seeds or pumpkin seeds. Also, I like to sprinkle some Homemade Vegan Parmesan cheese on top. 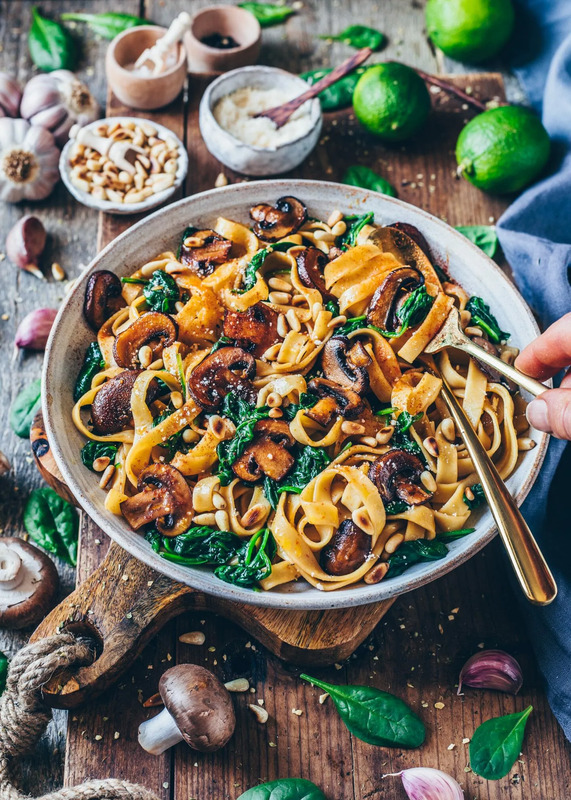 A quick recipe for Vegan Mushroom Pasta with Spinach. 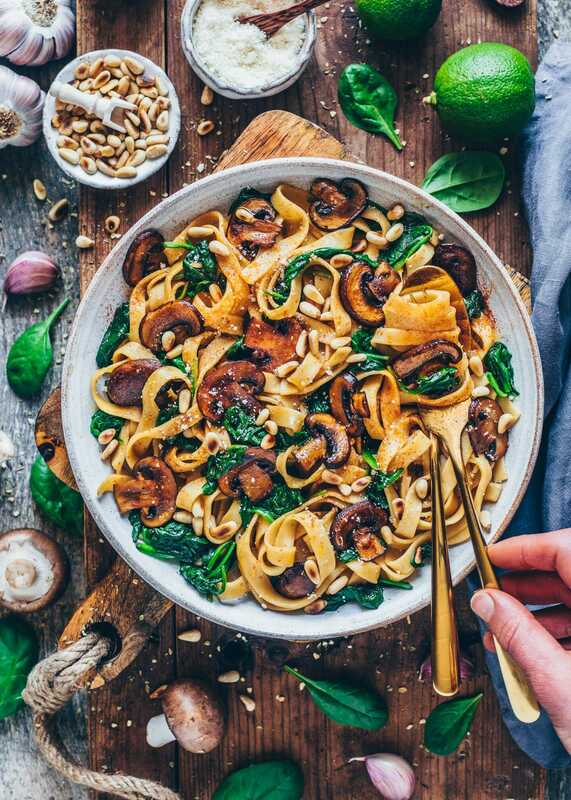 This pasta dish is delicious, healthy and easy to make. It's ready in only 15 minutes and makes a perfect simple dinner or lunch. Cook the pasta in salted water according to the package instructions. 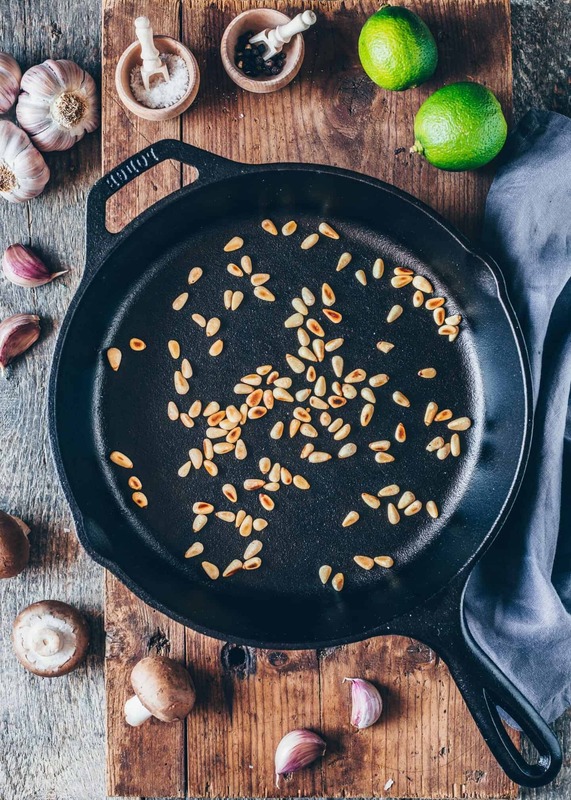 Toast the pine nuts in a small pan without additional oil. Then remove from the pan and set aside. 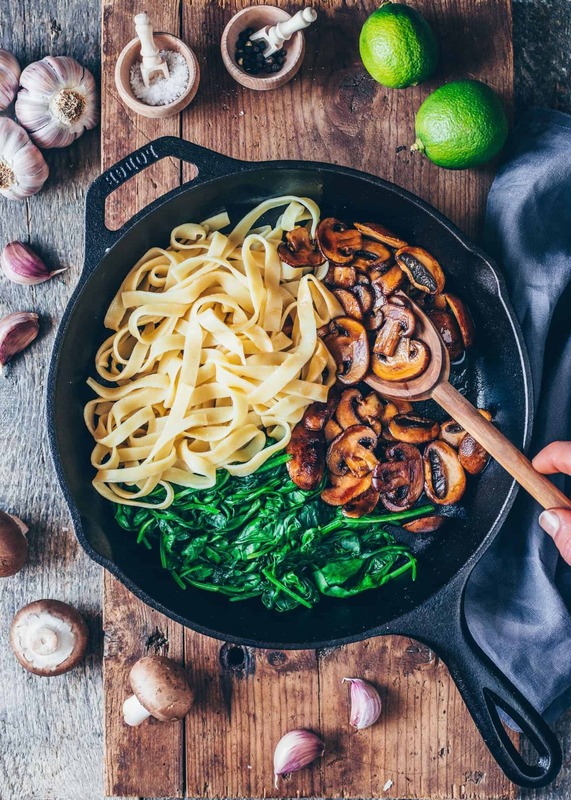 Heat the olive oil in a large skillet/ pan. Add the mushrooms along with the onions and sauté for about 3 minutes until lightly browned. Add the chopped garlic and cook for about 30 seconds longer. Then deglaze with soy sauce and a bit of vegetable broth (or plant-based cream). Reduce the heat and cook for about 1-2 minutes longer. Add the spinach and cook for further 2-3 minutes until it has wilted. Season with salt and pepper. Optionally, add a splash of fresh lime juice, if you like. Once the noodles are "al dente", pour off the cooking water. Put drained pasta to the mushrooms in the pan and toss to combine. Add yeast flakes or vegan parmesan as desired and season with spices to taste again. 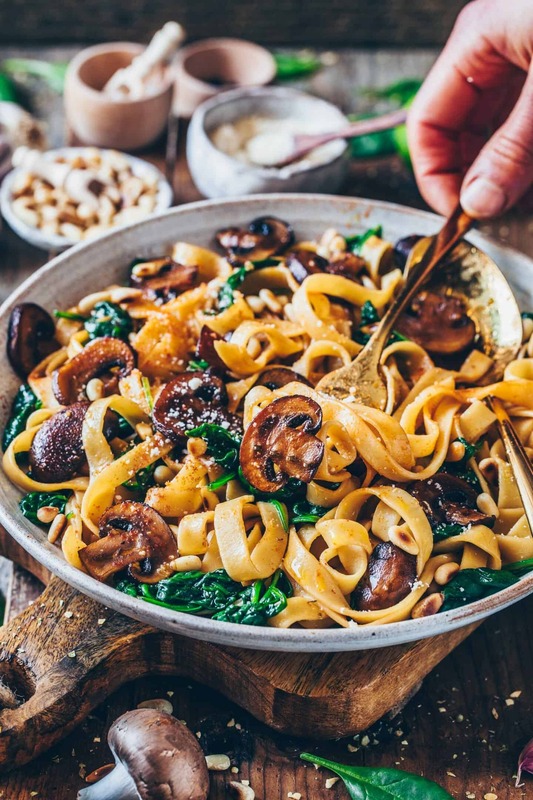 Serve the mushroom pasta with toasted pine nuts. 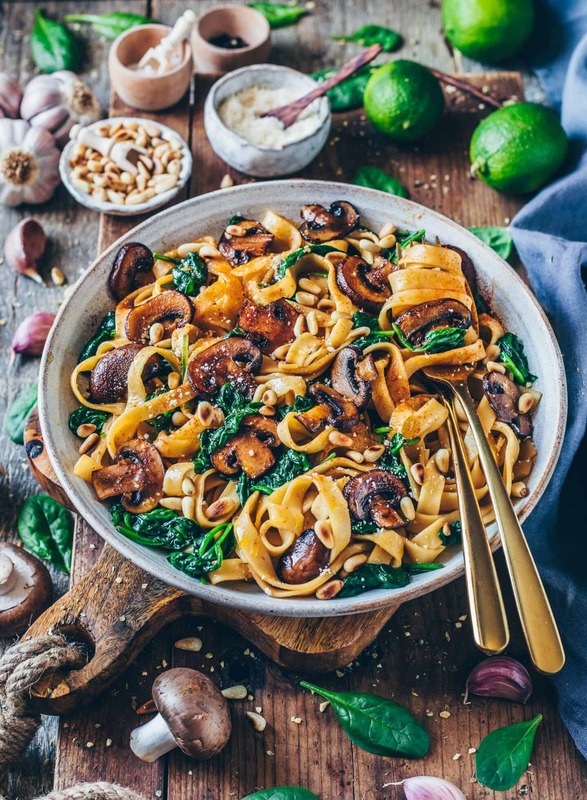 Instead of vegetable broth you can add plant-based cream or coconut milk, if you want to make a creamy mushroom pasta. You can also make your own pasta with this recipe for Homemade Pasta. This pasta was absolutely delicious and the recipe was super easy! Didn’t take long to prepare either. Definitely on my make again list. So glad that you liked it! 😊 Thank you so much!